Laos — CHINALAI TRIBAL ANTIQUES, LTD.
Tai cotton and silk skirt, northern Laos, late 19th century. Alternating bands of ikat and supplementary weft are unique to this type of Tai skirt. This one has exceptionally clear ikat and appealing presentation. The most unusual aspect of this lovely Tai Daeng woman's skirt with exceptionally crisp ikat is that narrow stripes of ikat patterning are contained within the separating bands of supplementary weft. Tai silk and cotton skirt, northern Laos, late 19th century. 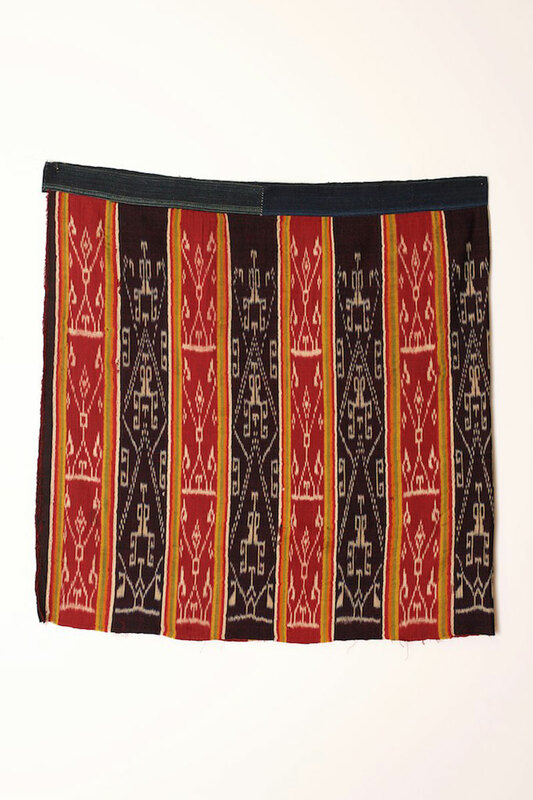 The absence of supplementary weft weave between the bands of ikat separates this Tai Daeng woman's skirt from the more traditional motif. 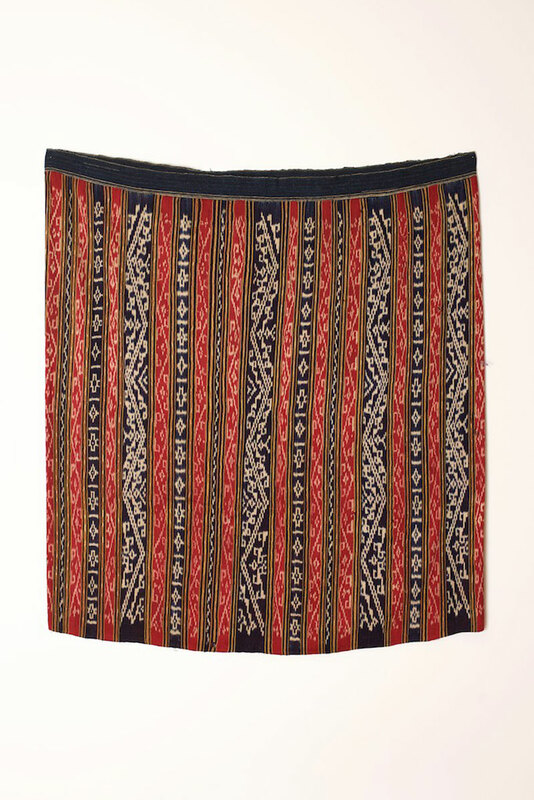 Alternating narrow bands of plain weave and ikat patterning create another variety of the traditional Tai Daeng woman's skirt. 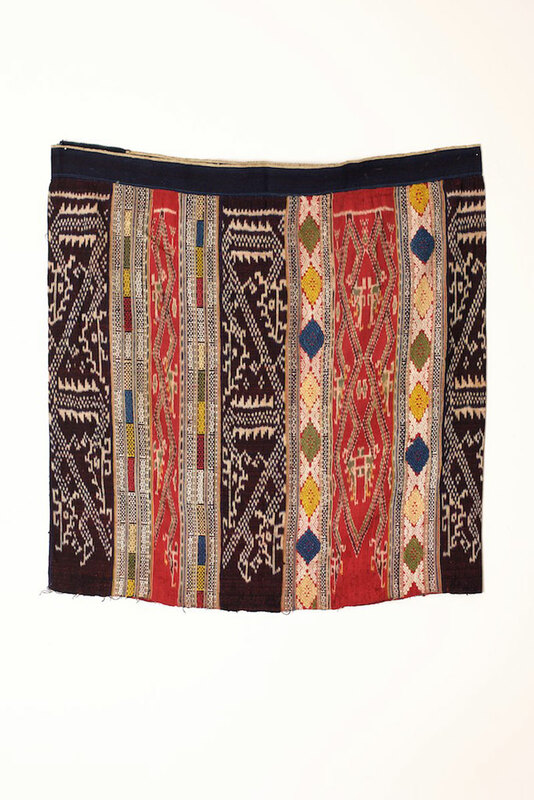 Tai cotton tube skirt, northern Laos, circa 1900. Unusual mostly ikat with supplementary weft stripes. Tai cotton and silk shaman's shoulder cloth, northern Laos, late 19th century. 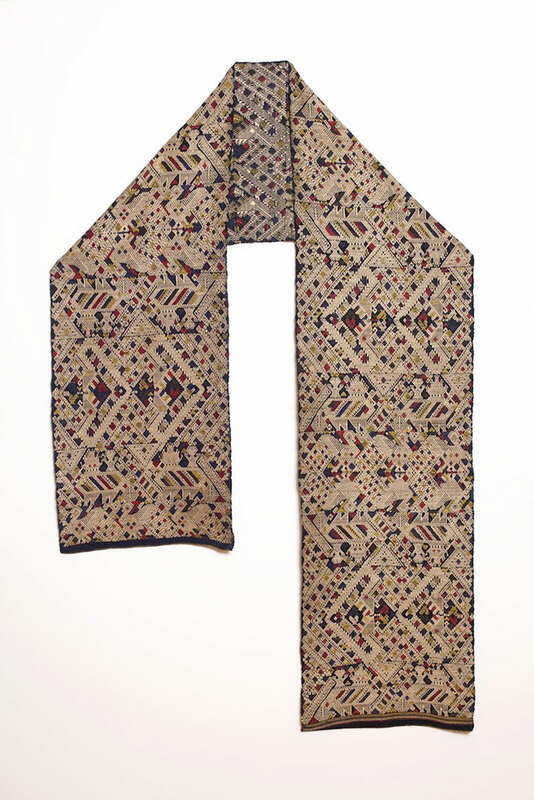 Extremely rare and beautiful, with silk supplementary weft on cotton base. Tai cotton and silk shaman's shoulder cloth, northern Laos, late 19th century, detail. Cotton blanket or sleeping mat, border region of northern Laos and Vietnam, early 20th century. Woven of natural cotton yarn and natural indigo-dyed cotton, then framed in cotton, this graphic weaving might have been used as a mat for sitting or sleeping, or as a cover for warmth. A family might have several, usually stored in baskets, to be unfolded for its own use or offered as sitting mats to honored guests. Cotton blanket or sleeping mat, border region of northern Laos and Vietnam, early 20th century, detail. Tai silk and cotton blanket or hanging, northern Laos, circa 1900. Silk supplementary weft on silk with a full cotton border. 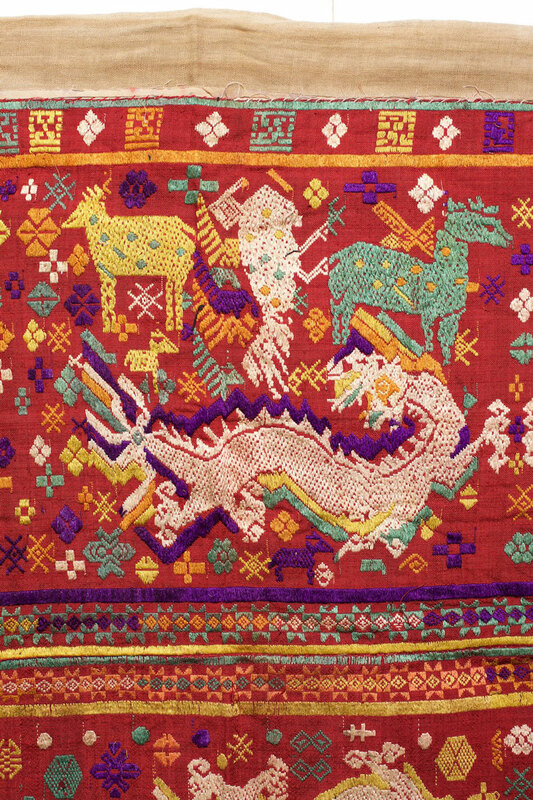 Tai silk and cotton blanket or hanging, northern Laos, circa 1900, detail. 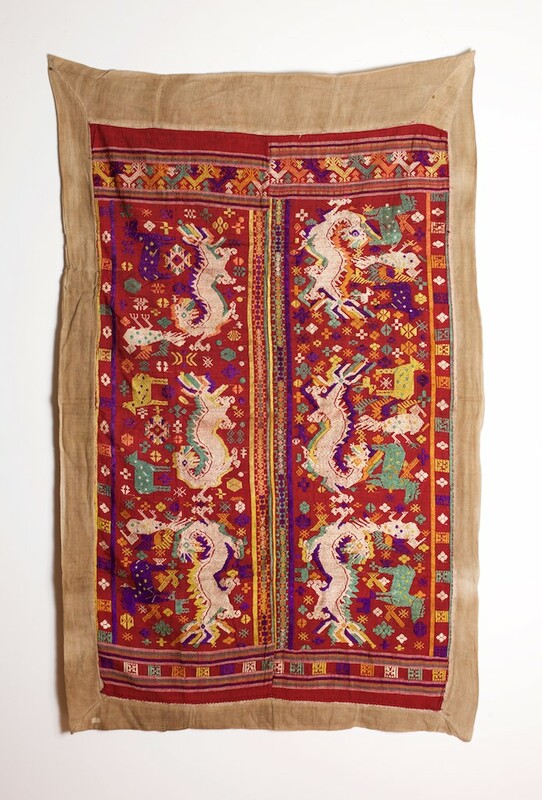 Tai silk and cotton blanket/hanging, northern Laos or northwest Vietnam, early 20th century. Silk and cotton funeral vestment, northern Laos, circa 1900. With silk supplementary weft lower band. Tai silk and cotton shaman's hat, northern Laos, circa 1900. Silk supplementary weft on silk with cotton embellishments. Yao Lantan silver celestial crown, northern Laos, turn-of-the-century. The crown was affixed to a girl's bun or top knot during an initiation ceremony, then worn throughout her life, especially for marriage and other rituals. Silver pins, secured by thread and beaten human hair, form concentric circles around the perimeter of the crown which has a separately inserted silver disk embossed with a ten-pointed star representing the Umbrella of Fam Tsing, the Three Pure Ones, important Taoist gods. This crown is part of a set with a wrapping cloth and a slide-opening wooden storage box for silver hairpins, yarn and glass streamers.